NON-CLINICAL staff in step-down care facilities run by voluntary welfare organisations (VWOs) will be paid more. The Health Ministry will be injecting $4 million to support salary increases of between 10 per cent and 24 per cent for more than 3,500 administrative, ancillary and support-care staff. Minister of State for Health Amy Khor, who made the announcement yesterday, said the funds boost, which took effect last month, "will strengthen the recruitment and retention" of non-clinical workers in the intermediate and long-term care (ILTC) sector. In a speech at a health manpower awards ceremony at Ren Ci Community Hospital, Dr Khor said salaries of staff in this sector have traditionally lagged behind those of staff in acute hospitals, making it challenging for the sector to attract and retain good staff. This latest injection of funds follows an announcement made earlier this year to raise the pay of 2,000 doctors, nurses and allied health professionals in the VWO-run step-down care centres. The Government is also looking at productivity initiatives and training upgrading opportunities to address the manpower challenges, said Dr Khor. To aid this, the ILTC-Upgrading Programme, which allows health-care professionals from this sector to pursue a degree in nursing or any of the allied health disciplines, was launched. Applications for this scholarship, administered by the Agency for Integrated Care, opened in July. Seven nurses and three allied health professionals have been given the scholarship, which will fund up to 90 per cent of the tuition and other compulsory fees. The remaining 10 per cent will be paid for by their ILTC institutions. Recipient Suhani Hamzah, 52, who has been a staff nurse at Ang Mo Kio-Thye Hua Kuan Hospital for the past decade, will be pursuing a degree in nursing next March. The mother of five children aged between 16 and 28 always wanted to upgrade her skills but had been unable to do so because of family commitments. "I am really grateful for the opportunity. 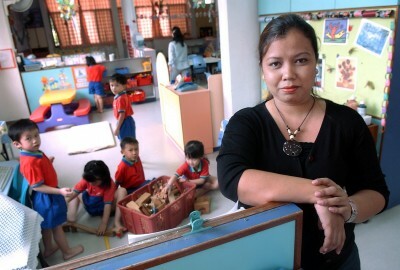 It will be a great challenge, since it's been a while since I was in school," she said. Speaking to reporters after the event, Dr Khor said non-clinical staff are "very important partners" of health-care professionals, and form more than half of the manpower in the ILTC sector. Ms Loh Shu Ching, chief executive of Ren Ci Hospital, said: "Any salary increase is definitely a very welcome move. This will make us very competitive in terms of attracting people... More training will also encourage more people to join us."